There are many ways to get from Frankfurt to Berlin (or from Berlin to Frankfurt). You can fly, take the bus, the train, or rent a car and drive yourself. Find out what transportation option is the best and most cost-efficient for you to get from Frankfurt to Berlin. For most travelers, flying is the best option between Frankfurt and Berlin. Frankfurt is the gateway to Europe for many travelers with thousands of international arrivals each day. After arriving at Frankfurt International Airport, you can easily continue your travel to the German capital by plane (or vice versa). Most major airlines, including German brands Lufthansa and AirBerlin, offer quick one-hour flights to Berlin with tickets usually start at $100 (round trip). Although taking the train is a bit slower, it is not necessarily cheaper than by air. It is, however, a very pleasurable way to travel the country and fairly stress-free. Deutsche Bahn operates the high-speed train (ICE) which reaches speeds up to 300 km/h travels from Frankfurt to Berlin. The direct journey takes about 4 hours with departures every hour, all day. Train tickets start at 29 euros but can cost as much as 150 euros one-way. Remember that you can get huge savings on long-distance train travel in Germany if you book your tickets well in advance. Purchase your ticket and reserve a seat (optional) on Deutsche Bahn's website or you can simply buy a ticket via a vending machine at the main train stations. The machines operate in English (as well as several other languages) and there are agents that can guide you through the process at the ticket desk. 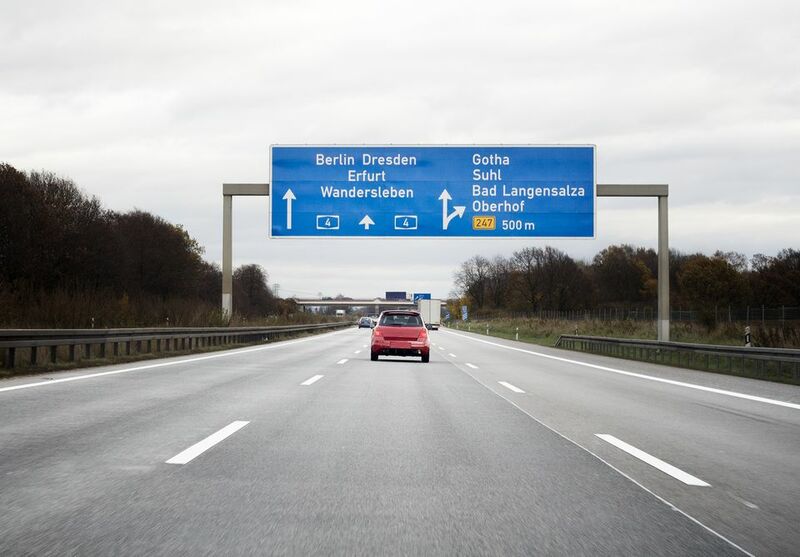 Do you plan to rent a car and speed down the world-famous Autobahn from Frankfurt to Berlin? The distance between the two cities is about 555 km (344 miles) and it will take you about 5 hours to reach the German capital. It is an exhilarating journey with several sights and cities along the way (such as Wartburg Castle and Weimar), but can also turn into a nightmare of traffic at high times and in case of accidents. As for car rental, base rates vary wildly depending on the time of year, duration of rental, age of driver, destination, and location of rental. Shop around to find the best price and note that charges usually do not include the 16% Value Added Tax (VAT), registration fee, or any airport fees (but do include the required third-party liability insurance). These additional fees may equal up to 25% of the daily rental. Still, renting a car is often the best option for families so they can comfortably travel together at the best price. Reserve your car in advance (14 days beforehand, ideally) for the best deals. Taking the bus from Frankfurt to Berlin is your cheapest option, as well as the longest. It usually takes about 8 hours to get from Frankfurt to Berlin, and the German bus company ​Berlin Linien Bus offers tickets as cheap as $15 (one way). Comfort levels are boosted by bus services like WiFi, air-conditioning, electrical outlets, free newspapers, sleeper seats, and—of course—toilets. Coaches are generally clean and arrive on time—again, barring issues with traffic.